Recently, two new animated shorts came out, featuring Princess Leia from the original trilogy. 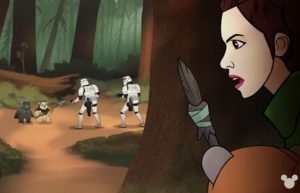 Part of Star Wars Forces of Destiny, the two animated shorts show us Princess Leia on Hoth and on the forest moon of Endor. 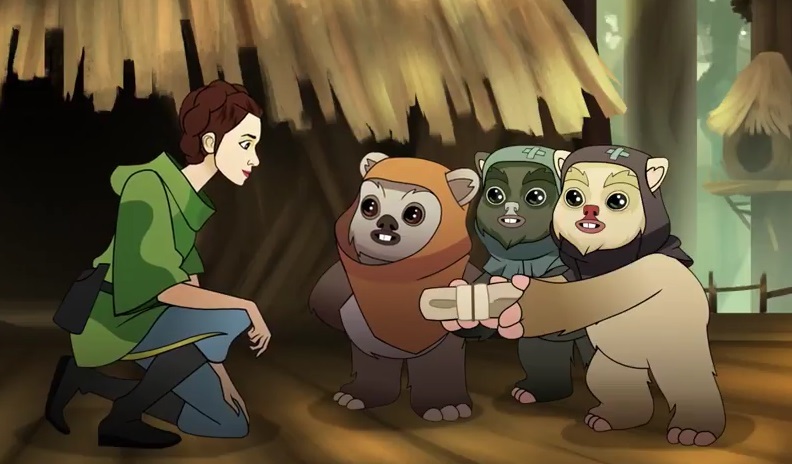 The first of these, “Ewok Escape”, shows us Princess Leia interacting with some Ewoks between her having met Wicket and coming to the Ewok village in Return of the Jedi. It is essentially some additional scenes to the movie, which also helps answer an interesting question from the movie: how did Princess Leia’s outfit change? 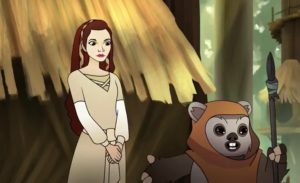 After helping Wicket rescue two Ewoks from a couple of stormtroopers, Princess Leia returns with them to the Ewok village and is presented with a gift, which turns out to be a dress. Yes, the same dress she wears in the Ewok village, when her Rebel comrades are taken to the village. 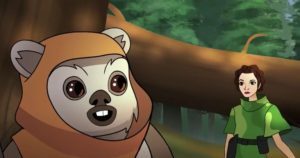 There are two main things that this animated short accomplishes: one, we get to see a little bit of interaction between Princess Leia and and Wicket, but it also shows us what happens between stormtroopers and Ewoks – how do they interact? A question voiced by one of the stormtroopers is an interesting one: “Can you believe it? These things are everywhere. Primitives. I’m surprised the Empire didn’t deal with them when we arrived.” While there are no answers for this question, it is interesting to see a stormtrooper voicing this concern. 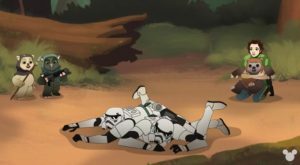 It is also interesting to see how the stormtroopers patrolled the forests surrounding their base. 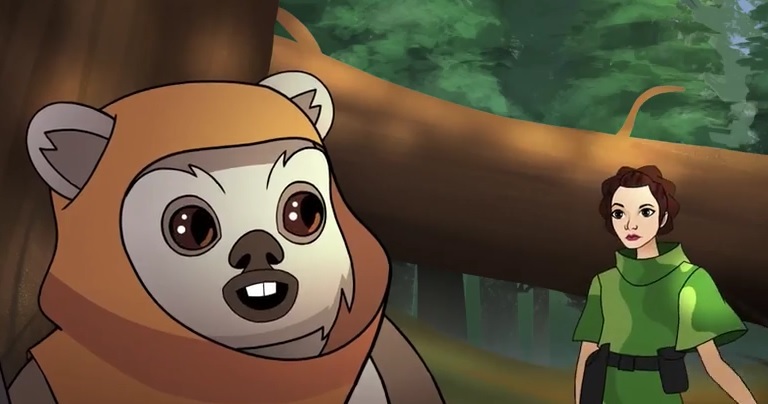 This animated short was certainly cute and was great to see Ewoks, as well as Princess Leia again. The other animated short last week, was less cute, however. In “Beasts of Echo Base“, we see another animated short involving Princess Leia from the original trilogy – this time, what could be considered a prelude to The Empire Strikes Back. At the outset, Princess Leia is searching around Echo Base for Chewbacca, since no one has seen him while he is digging corridors for the base. 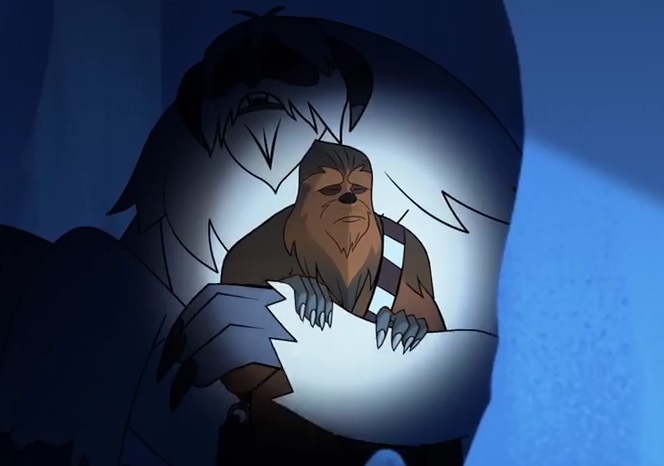 Just beyond a doorway that is incompletely installed, there is a cavern in which Chewbacca is cuddled up like a teddy bear within the clutches of a wampa. 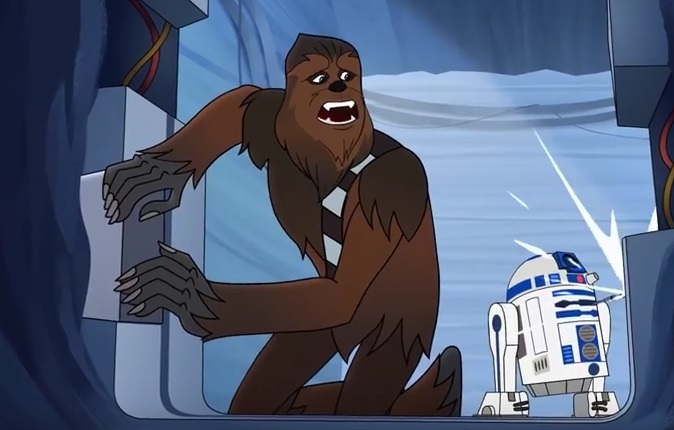 When the wampa is woken up, Chewbacca is able to escape its grasp, whereupon Princess Leia takes charge and tells him and R2-D2 to fix the door while she distracts the wampa. 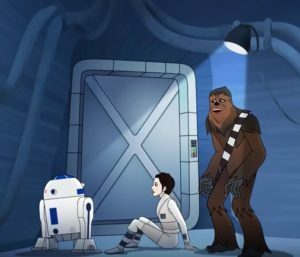 Bravely distracting the wampa and running around, she is able to successfully stall for enough time for Chewbacca and R2-D2 to fix the door and keep the wampa out of the base. While it is an action-filled animated short, I found it most interesting that it makes us wonder “How far back did they excavate and dig Echo Base?” Also, since we see a wampa in the movie living in a cave, is it not unexpected to find a wampa living within a cavern? 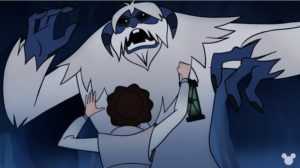 I enjoyed that this animated short suggests maybe there are spaces just slightly beyond Echo base and you might find a Wampa within them. 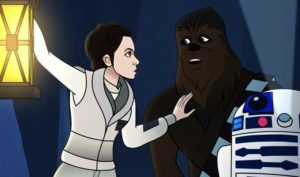 One thing that I really like about this animated short is that it is an interesting call back reminiscent of deleted scenes from The Empire Strikes Back in which there is a room for wampas – we don’t know why they’ve captured it, how they captured it, or why they’re keeping it there. Whatever the reason, it is great to have Hoth and its dangers explored a bit further. * Why the Ewoks would have a human-sized dress that fits Leia is another question, currently left unanswered….